In our world, modern wars were fought with firearms, missiles, and bombs. They were still dangerous affairs, but they didn’t hold the personal element of jamming a blade into the stomach of an enemy, and looking into their eyes as they took their last breath. Hand-to-hand combat is a slog, a meat grinder, a bloodbath. You feel the deaths of the people around you, and any advantage you can get on the battlefield, any edge you can perceive, is used to just keep you alive. Sometimes slaughtering your opponents is the result of brute strength. At other times, a Tribe has to rely on their quick-thinking, inventiveness, and ingenuity. In the Um’Kator Tribe, everyone pulls their weight. They detest laziness and see it as the ultimate sin. While others lie in rest, the Um’Kator approach slowly, silently, with blades drawn, and slit their enemy’s throats in the night. The Um’Kator rely on their flexibility to succeed in battle and to keep fresh meat in the bellies of the young ones of the Tribe. In battles, they have the ability to manipulate the dice, turning a glancing blow into fatal wound. The opponents of the Um’Kator may think they understand them. They may think they even have a physical advantage. But the Um’Kator are masters of trickery, and what you see of them is only what they want you to see. The cards in the Um’Kator Tribe deck provide them with options. They can choose to active the ability that best suits the situation. They are able to cycle through the deck quickly and find what they need, when they need it. Power is important, especially when life or death comes at the end of a blade, but so too, is flexibility. The power to adapt is what has kept the Um’Kator together for so long. Players can take control of the Um’Kator Tribe when HATE comes to Kickstarter on January 16, 2018 at 3PM EST. 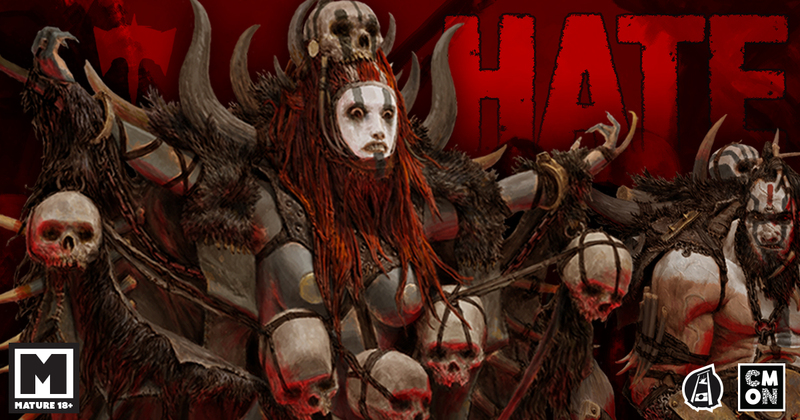 Follow the HATE Facebook page for updates on the art, minis, and articles. Read the overview of HATE here.